The Saudi Association for Pulmonary Hypertension (previously called Saudi Advisory Group for Pulmonary Hypertension) has published the first Saudi Guidelines on Diagnosis and Treatment of Pulmonary Arterial Hypertension back in 2008. 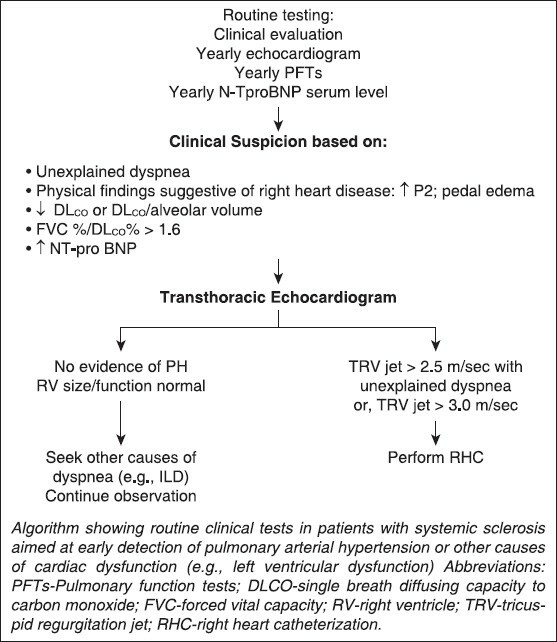 That guideline was very detailed and extensive and reviewed most aspects of pulmonary hypertension (PH). One of the disadvantages of such detailed guidelines is the difficulty that some of the readers who just want to get a quick guidance or looking for a specific piece of information might face. All efforts were made to develop this guideline in an easy-to-read form, making it very handy and helpful to clinicians dealing with PH patients to select the best management strategies for the typical patient suffering from a specific condition. This Guideline was designed to provide recommendations for problems frequently encountered by practicing clinicians involved in management of PH. This publication targets mainly adult and pediatric PH-treating physicians, but can also be used by other physicians interested in PH. 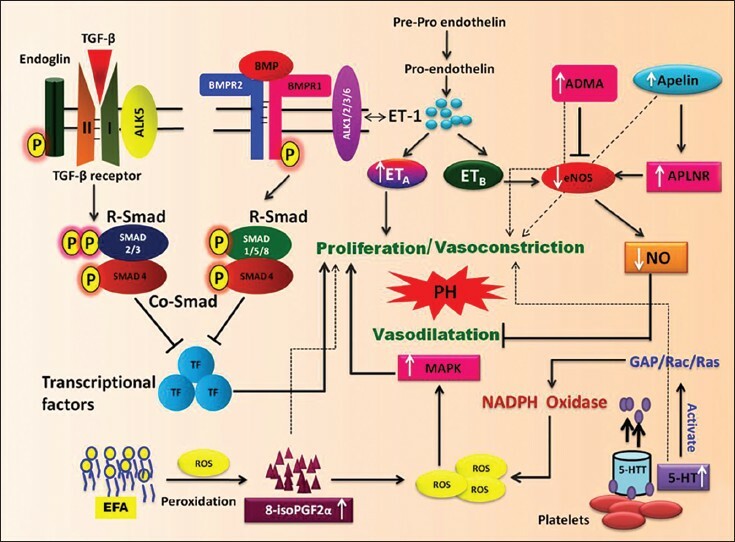 Pulmonary hypertension (PH) is a phenotype characterized by functional and structural changes in the pulmonary vasculature, leading to increased vascular resistance. , The World Health Organization has classified PH into five different types: arterial, venous, hypoxic, thromboembolic or miscellaneous; details are available in the main guidelines. Group I of this classification, designated as pulmonary arterial hypertension (PAH), will remain the main focus here. The pathophysiology involves signaling, endothelial dysfunction, activation of fibroblasts and smooth muscle cells, interaction between cells within the vascular wall, and the circulating cells; as a consequence plexiform lesions are formed, which is common to both idiopathic and heritable PAH but are also seen in other forms of PAH. 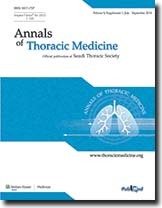 ,, As the pathology of PAH in the lung is well known, this article focuses on the genetic aspects associated with the disease and is a gist of several available articles in literature. Congenital heart disease (CHD) with intracardiac/extracardiac shunts is an important etiology of pulmonary arterial hypertension (PAH). The majority of children with congenital cardiac shunts do not develop advanced pulmonary vasculopathy, as surgical repair of the anomalies is now performed early in life. However, if not repaired early, some defects will inevitably lead to pulmonary vascular disease (truncus arteriosus, transposition of the great arteries associated with a ventricular septal defect (VSD), atrioventricular septal defects remarkably in Down syndrome, large, nonrestrictive VSDs, patent ductus arteriosus and related anomalies). The majority of patients are now assigned to surgery based on noninvasive evaluation only. PAH becomes a concern (requiring advanced diagnostic procedures) in about 2-10% of them. In adults with CHD, the prevalence of advanced pulmonary vasculopathy (Eisenmenger syndrome) is around 4-12%. This article will discuss the diagnostic and management approach for PAH associated with CHD (PAH-CHD). The explosive growth of medical literature on pulmonary hypertension (PH) has led to a steady increase in awareness of this disease within the medical community during the past decade. The recent revision of the classification of PH is presented in in the main guidelines. Group 1 PH or pulmonary arterial hypertension (PAH) is a heterogeneous group and includes PH due to inheritable, drug-induced, and toxin-induced causes and to such underlying systemic causes as connective tissue diseases, human immunodeficiency viral infection, portal hypertension, congenital heart disease, and schistosomiasis. Systemic sclerosis (SSc) is an autoimmune multisystem disorder, which affects over 240 persons per million in the United States. Its manifestations are not confined to the skin but may also involve the lungs, kidneys, peripheral circulation, musculoskeletal system, gastrointestinal tract, and heart. The outcome of PAH associated with SSc is worse when compared to other subtypes of PAH. 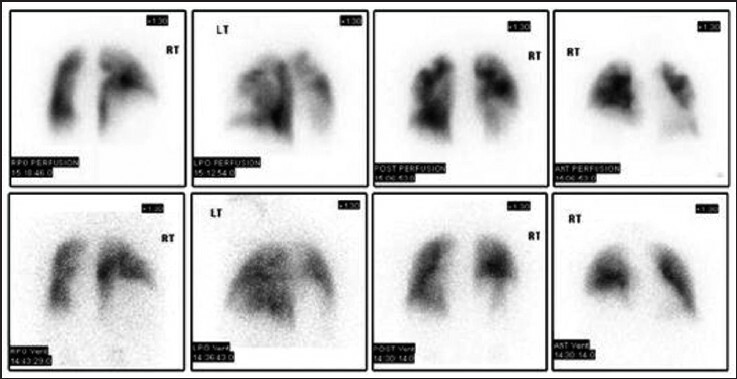 In this review, we summarize available information about the pulmonary vascular and cardiac manifestations of SSc with special emphasis on their prognostic implications as well as the peculiarity of their detection. Schistosomiasis is caused by infection with the parasite Schistosoma, which is a flat-worm or fluke. The dominant species are Schistosoma mansoni, Schistosoma japonicum, and Schistosoma haematobium. Schistosomiasis is the third most common parasitic disease in the world after malaria and amoebiasis. It is endemic in more than 70 countries affecting about 200 million people worldwide, of whom 80% are in sub-Saharan Africa. There are pockets of infection in north-eastern Brazil, near the Yangtze River in China, and some pockets in south East Asia. In the East Mediterranean regions, the Schistosoma have been reported in Iraq and Egypt as well as in Sudan. The latter has the highest infection rate nowadays, particularly in the Al Jazeera area, due to the poor Schistosoma control program. In the Arabian peninsula, schistosomiasis has been reported in southwest part of Saudi Arabia, mainly in the Asir province and Jizan province, which lay in the southwest corner of Saudi Arabia and directly north of the border with Yemen. The efforts to control schistosomiasis have been very successful in Saudi Arabia due to the irrigation system control. However, the infection is prone in Yemen, where the schistosomiasis control is much less strict. Thus as a result, the problem still exists due to transmigration of the populations from both countries. As a cause of pulmonary arterial hypertension (PAH), schistosomiasis is still under diagnosed and undertreated. This article with give a highlight about the pathophysiology of the disease and both diagnostic and therapeutic strategies. Portopulmonary hypertension (POPH) is defined as pulmonary arterial hypertension (PAH) complicated by portal hypertension, with or without advanced hepatic disease. Significant percentage of patients with cirrhotic liver disease has high cardiac output and subsequently elevated pulmonary arterial pressures (PAP). However, patients with POPH develop a progressive increase in pulmonary vascular resistance (PVR), which is generally lower than that observed in other forms of PAH. The prognosis of untreated patients with POPH is very poor and the outcome of liver transplant (LT) in those patients is determined by the degree of severity of the associated pulmonary hemodynamics. 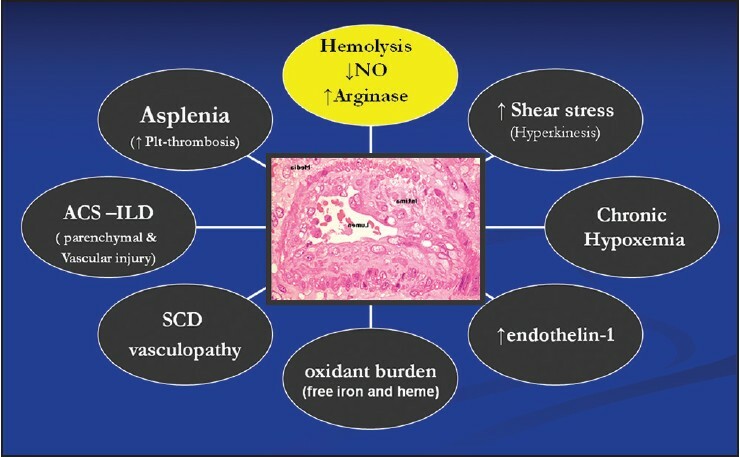 In this narrative review, we describe the clinical presentation of POPH, the pathobiology, and the clinical implication of pulmonary hemodynamics. We also provide evidence-based recommendations for the diagnosic and management approaches of POPH. Pulmonary hypertension (PH) due to left heart disease is the most common cause of pulmonary hypertension in the western world. It is classified as WHO PH group II. Different pathophysiologic abnormalities may take place in this condition, including pulmonary venous congestion and vascular remodeling. Despite the high prevalence of WHO group 2 PH, the major focus of research on PH over the past decade has been on WHO group 1 pulmonary arterial hypertension (PAH). Few investigators have focused on WHO group 2 PH; consequently, the pathophysiology of this condition remains poorly understood, and no specific therapy is available. Clinical and translational studies in this area are much needed and have the potential to positively affect large numbers of patients. In this review, we provide a detailed discussion upon the pathophysiology of the disease, the recent updates in classification, and the diagnostic and therapeutic algorithms. Chronic lung diseases are common causes of pulmonary hypertension. It ranks second after the left heart disease. Both obstructive and restrictive lung diseases are know to cause pulmonary hypertension. The pathophysiology of the disease is complex, and includes factors affecting the blood vessels, airways, and lung parenchyma. Hypoxia and the inhalation of toxic materials are another contributing factors. Recent guidelines have further clarified the association between pulmonary hypertension and chronic lung disease and made general guidelines concerning the diagnosis and management. In this article, we will provide a detailed revision about the new classification and give general recommendations about the management of pulmonary hypertension in chronic lung diseases. Chronic thromboembolic pulmonary hypertension (CTEPH) is categorized as group IV in the WHO classification for pulmonary hypertension. The disease requires a very low index of suspicion for identification and needs a special diagnostic approach utilizing clinical, radiological, and hemodynamic tools. As CTEPH is potentially curable, all efforts should be consumed to reach the accurate diagnosis and subsequently evaluated for operability. Although pulmonary endarterectomy (PEA) is the only curative tool so far, recent updates concerning medical and interventional therapy have made significant advances in inoperable patients. In this review, we provide a detailed discussion on diagnostic algorithm, surgical operability criteria, PEA, and the medical therapy. Hereditary hemoglobin disorders affecting the globin chain synthesis namely thalassemia syndromes and sickle cell disease (SCD) are the most common genetic disorders in human. Around 7% of the world population carries genes for these disorders, mainly the Mediterranean Basin, Middle and Far East, and Sub-Saharan Africa. An estimated 30 million people worldwide are living with sickle cell disease, while 60-80 million carry beta thalassemia trait. About 400,000 children are born with severe hemoglobinopathies each year. Cardiovascular complications of hemoglobinopathies include left and right ventricular (RV) dysfunction, arrhythmias, pericarditis, myocarditis, valvular heart disease, myocardial ischemia, and notably pulmonary hypertension (PH). 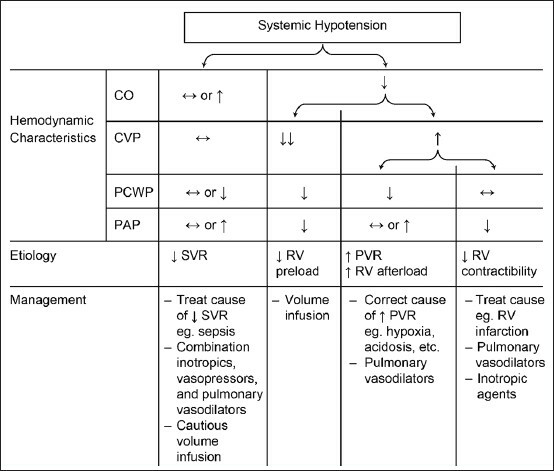 Because of a unique pathophysiology, pulmonary hypertension associated with hemolytic disorders was moved from WHO group I to group V PH diseases. Treatment strategies are also unique and include blood transfusion, iron chelation, hydroxyurea, and oxygen therapy. The role of PH-specific agents has not been established. Treatment of pulmonary hypertension (PH) patients is challenging and should only be initiated after a comprehensive diagnostic evaluation. 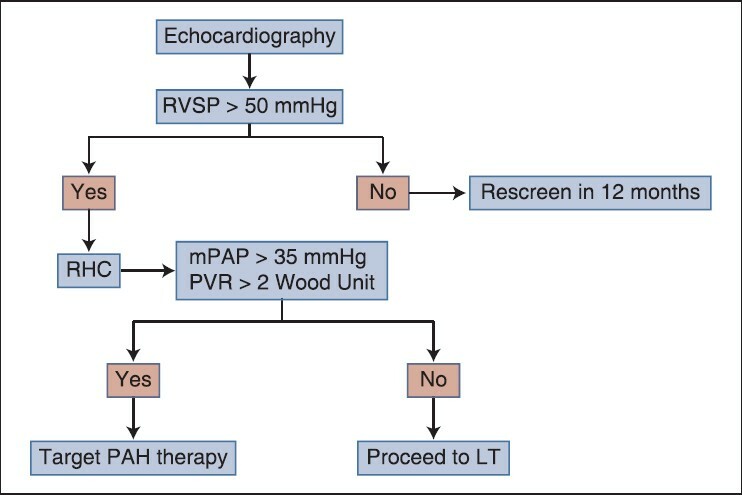 Such treatment should ideally be done in specialized centers with full capability for hemodynamic measurements, having access to a broad range of PAH therapies, and adequate experience in the management of critically ill patients. The following discussion is intended to review the general measures and the non-specific (supportive) therapy used in managing PH patients, while the specific therapy will be discussed in a subsequent different article. Prior to the availability of the pulmonary arterial hypertension (PAH)-specific therapy, PAH was a dreadful disease with a very poor prognosis. Better understanding of the complex pathobiology of PAH has led to a major therapeutic evolution. International regulatory agencies have approved many specific drugs with different pharmacologic pathways and routes of administration. In the year 2013, two new drugs with great potentials in managing PAH have been added to the treatment options, macitentan and riociguat. Additional drugs are expected to come in the near future. A substantial body of evidence has confirmed the effectiveness of pulmonary arterial hypertension (PAH)-specific therapies in improving the patients' symptomatic status and slowing down the rate of clinical deterioration. the newer modern medications have significantly improved the survival of patients with PAH, it remains a non-curable and fatal disease. Lung transplantation (LT) remains the only therapeutic option for selected patients with advanced disease who continue to deteriorate despite optimal therapy. The biomarker is an indicaror of a biological or pathological process. Clinical observations, measures or environmental events, or measured laboratory values can all be biomarkers in the appropriate setting. An ideal biomarker reflects the underlying biological process, predicts clinical events, is easily obtainable, is reproducible and is not prohibitively expensive. This typically requires validation in longitudinal cohort studies. Biomarkers may help understand the pathological mechanisms responsible for the disease, help as screening tools, predict disease worsening or decline, and determine adequacy of response to therapeutic interventions. Patients with pulmonary hypertension (PH) are being encountered more commonly in the perioperative period and this trend is likely to increase as improvements in the recognition, management, and treatment of the disease continue to occur. Management of these patients is challenging due to their tenuous hemodynamic status. Recent advances in the understanding of the patho-physiology, risk factors, monitoring, and treatment of the disease provide an opportunity to reduce the morbidity and mortality associated with PH in the peri-operative period. Management of these patients requires a multi-disciplinary approach and meticulous care that is best provided in centers with vast experience in PH. In this review, we provide a detailed discussion about oerioperative strategies in PH patients, and give evidence-based recommendations, when applicable. Pregnancy in pulmonary hypertension (PH) is known to be associated with high morbidity and mortality. The physiological changes occur during normal pregnancy, such as increase blood volume and cardiac output (CO) may be detrimental in PH patients. Several practice guidelines advise against pregnancy and even recommend termination of pregnancy. Occasionally PH may be diagnosed for the first time during pregnancy, as stress of pregnancy can unmask previously undiagnosed PH in an asymptomatic individual. This narrative review provides a detailed discussion about the physiologic parameters associated in pregnancy and their negative effect on the right ventricle. It also gives practical evidence-based recommendations about different management issues in PH pregnant patients. Pulmonary hypertension (PH) is relatively uncommon in children. Pulmonary arterial hypertension (PAH) in pediatric comprises a wide spectrum of diseases, from a transient neonatal condition to a progressive disease associated with morbidity and mortality. Most common PAH in pediatric are idiopathic (IPAH) or PAH associated with congenital heart disease (PAH-CHD), while other associated conditions, such as connective tissue disease (CTD), are less common in pediatrics. Despite better understanding of PH and the availability of new medications during recent decades; the diagnosis, investigation and choice of therapy remain a challenge in children, as evidence-based recommendations depend mainly on adult studies. 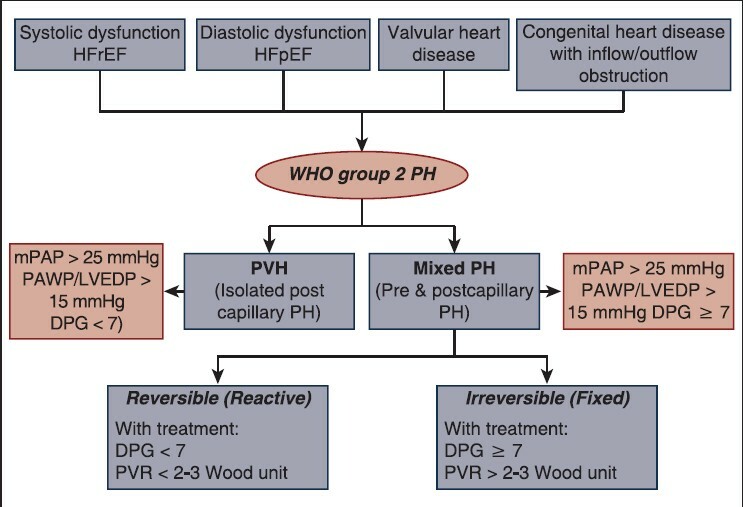 In this review, we provide a detailed discussion about the distinctive features of PAH in pediatric, mainly emphacysing on classification and diagnostic algorithm. Pulmonary hypertension (PH) in the Intensive Care Unit (ICU) may be due to preexisting pulmonary vascular lung disease, liver disease, or cardiac diseases. PH also may be caused by critical illnesses, such as acute respiratory distress syndrome (ARDS), acute left ventricular dysfunction and pulmonary embolism, or may occur after cardiac or thoracic surgery. Regardless of the underlying cause of PH, the final common pathway for hemodynamic deterioration and death is RV failure, which is the most challenging aspect of patient management. Therapy is thus aimed at acutely relieving RV overload by decreasing PVR and reversing RV failure with pulmonary vasodilators and inotropes. There is scant published data about pulmonary hypertension (PH) from the developing countries. True prevalence of the disease, its biology, etiology and response to treatment are not well known, and they are likely to be somewhat different from that of the developed countries. In this review, we will discuss the main challenges for managing PH in developing countries and propose real-life recommendations to deal with such difficulties.